A historic figure, whom the nation holds dear in their hearts to this day. Find out more about the hero of Sudan. Meet fellow Kitchener Scholars and connect with a wide range of fascinating people at one of our events. Purchase some of our KSA cufflinks or KSA hoodies through our online store. Welcome to the Official web site of the Kitchener Scholars' Association (KSA). The scholarships awarded by the Kitchener Fund are higher education grants for members of the armed forces and their families. Click here for details of how to Apply for a Kitchener Scholarship. 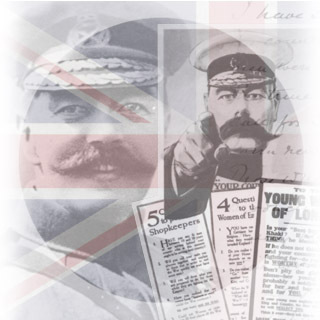 This web site is a valuable resource for those wishing to know about Lord Kitchener and the Lord Kitchener National Memorial Fund (LKNMF), helping to perpetuate the memory of the man who immortalised the words 'Your Country Needs YOU'. READ THE LATEST KSA NEWSLETTERS HERE. You are welcome to browse our site and if you have any questions regarding the KSA or the LKNMF please contact us. For further information on the first Earl Kitchener see the reading list.